As the capital city, Guiyang is the political, economical, cultural and traffic center of Guizhou province. It has a total area of 8032 sq.m. with a population of 3.1143 million and 5 prefectures, 3 counties and a municipality under its administration. green surrounding and pleasant moist climate, with an average temperature of 15.6°C. It is praised as "The second Spring City", an ideal place for surrtncr resort and tourism. Qian. For many generations after the Tsin Dynasty(265-420 AD), county and prefecture governments as well as Guizhu commanding officers' jurisdictions were set up here, so it is also named "zhu", "Golden Zhu", "Zhu City" etc. Since 1941, a municipality has been established here. Guiyang, rich in scenic attractions and historic relics, enjoys graceful beauty and enchanting landscape. The famous beauty spots in its urban district are Jiaxiu Tower, Fongfu Temple, Qianling Mountain, Qianling Lake, Wenchang Pat ilion, etc., while in the suburb are the South Suburban Park, Flower Brook, Milky Way Pond, Red Maple Lake, Kaiyang Nanjiang Canyon Park. All Flowers Lake, old site of Xifeng Concentration camp, etc. in city embraced by many mountains. Lying on a huge rock ill Nanming River, Guiyang, Jiaxiu Tower was initially built by a provincial governor in the 25th Year( 1597) of Wanli's Reign in the Ming Dynasty, with the purpose of encouraging scholars to make progress. Inside is a long antithetical couplet written by Liu Wenliang, bout ill Guiyang dming the Qing Dynasty. It is listed as a provincial key cultural preservation. Standing on Qianlingshan Mountain ill Guiyang, Hongfu Temple teas initially to be built by Cisong, a Founder Buddhist monk, during the 11Ith Year( 1672) in the Kanghsi's Reign in the Qing Dynasty. It is a provincial reserve for its cultural relics. 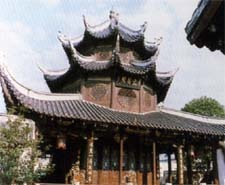 Lying on Yueeheng ( Moon Mall) in the East Door of Guiyang, Wenchang Pavilion, which was also named Wenchang Shrine, was started to he built in the 37th Year(1609) during the Waugh's Reign in the Ming Dynasty and reconstructed in the 8th Year( 1669) of Kanghsi's Reign in the Qing Dynasty. It is a provincial reserve for it, cultural relics. Gorges, Zhenshan National Stockade and the Milky Way Pond. islets in total. In addition to hills, Beaters, islets, there are also Miao, Dong, Buy ethnic stockades with national customs and dancing and singing performance. Located at northwest suburb of Guiyang, 22 km. from Guiyang city, the All Flower Lake occupies an area of 13500 sq.m. It is rcputed for its charming and gentle landscape and graceful surroundings. In the lake, there are more than 100 islets with various grotesque shapes. The Milky Way Pond scenic district can be dig ided into three paits(watcr cavern, dry cavern and outer landscape). The water cavern. neighbors the dry cavern, and green water in the deep pond in front of the caverns a, surrounded by cliffs, forming extraordinary sight and marvelous spectacle.